Mark Wright became one of NZ television's most familiar faces in the 1990s, by imitating other people. The drama school graduate became a a reluctant comedian in an era of skit based shows that included Issues, LaughINZ, That Comedy Show, and Newsflash. 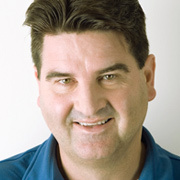 His work on Issues and Sportsnight won him two NZ Film and Television awards. Wright's CV also includes a long run of stage roles, as well as live MC'ing and film acting.